In just about every form of Motorsport, especially in circuit racing, the starting grid for every race is created from a traditional qualifying session where the competing drivers compete against the clock to set the fastest lap time. The winner from this session gains the coveted ‘Pole Position’ on the grid, running down to the slowest driver starting from last. It is taken for granted that this is the ‘fairest’ way of creating the race grid and starting order. This has a knock-on effect over the race, that with the fastest driver starting from the front, and the slowest driver starting from the back, the race has been all but ‘won’ during the qualifying session and very little over-taking and action actually happens during the race. BriSCA F1 Stockcar Racing is different. 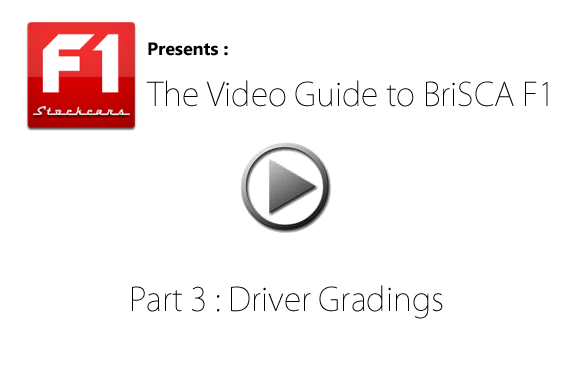 BriSCA F1 uses a grading system. There is never any qualifying sessions against the clock in BriSCA F1, just races. Grading Points are scored in every race, of every meeting. These points do not count towards any championship, they are used to determine a drivers success. A drivers monthly Grading Points total is used to calculate which Grade a driver belongs in, and therefore his starting position on the grid. There are 5 main Grades in BriSCA F1. These Grades are used to create the Grid for each race. Each grade forms a block of cars lined up two-a-breast and bumper to bumper, with a two-car-length gap between each Grade. The White Tops start at the very front, followed by Yellow, then Blue, the Reds, and the Superstars at the very back. Grading is designed to produce closer racing with more action, a festival of speed and overtaking as the Superstars chase down the front runners from their three-quarter lap handicap, and doing so is no easy task when races can be as short as 16 laps, at an average of just 15 seconds per lap. At the end of each monthly Grading period, a Drivers grading points are used to check whether they are in the right Grade. It is possible for drivers to be both demoted as well as promoted, up and down the Grades. This can create situations where a Driver who would ordinarily be Graded as a Red Top, could have had a bad month, maybe suffering from car problems or getting caught up in the wars of Full Contact Racing, and be down graded to Blue Top. Likewise, a Driver who’s normal regular Grading may be Yellow Top, could have had an exceptionally good month and received the handicap of being upgraded to Blue Top. This is where Grades within Grades comes into affect. A driver who has been newly promoted to a higher Grade will be lined up towards the front of the new Grade, and a Driver who has been recently demoted down a Grade will be lined up at the back of his grading. This all helps ensure that drivers are lined up on the Grid amongst other drivers of similar skills. Drivers must display their designated grade at all times by painting their roof/wing to the grades appropriate colour. White for Grade “C”, Yellow for Grade “B”, Blue for Grade “A”. The “Star” drivers use Red, and the Superstars use Red with Flashing Orange Lights. There are a couple of exceptions to these colours. The Championship title holders have unique colours to distinguish them from the rest of the drivers. The World Champion has a Gold roof, The National Champion has a Silver roof, The British Champion has a Black & White Chequered roof, and the European Champion has a Red & Yellow Chequered roof. The attached video in this post focuses on just one driver. It follows Frankie Wainman Jnr (515) in the Final at Ipswich in 2012. It captures his progress through the field from his ‘Superstar’ grid location at the back of the field over 20 laps to grab first place just in time for the chequered flag. Sit back and watch a BriSCA F1 Stockcar superstar at work.